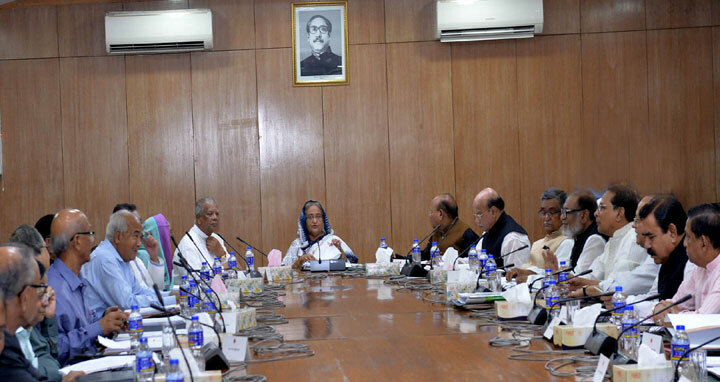 Dhaka, 14 May, Abnews: The cabinet at its weekly meeting today congratulated Prime Minister Sheikh Hasina and her ICT advisor Sajeeb Ahmed Wazed Joy for successful launching of Bangladesh's first geostationary communications satellite-'Bangabandhu Satellite-1' to the space. Minister for Post and Telecommunications Mustafa Jabbar and State Minister for ICT Zunaid Ahmed Palak presented a bouquet to the Prime Minister. Cabinet Secretary Md Shafiul Alam said this while briefing reporters after the cabinet meeting at Bangladesh Secretariat here. The cabinet also adopted a motion placed by Finance Minister Abul Maal Abdul Muhith felicitating the Prime Minister and Sajeeb Ahmed Wazed for successful launching of Bangabandhu Satellite-1 and becoming 57th nation in the world to launch satellite in the orbit, the cabinet secretary said.